Though my design journal is new, I'm not new to design. Some might even call me a veteran. I completed a BFA in interior design in 1999 as a returning student, and have been designing ever since. It sounds crazy now, given all the do-it-yourself website and social media platforms, but it seemed when I was starting my design business that the only people who had websites were those who were well established, had large budgets, and could afford to hire web developers. Fortunately things have changed since then! Fast forward to now...you might be wondering why it's taken me so long to jump on the blog train? The answer? PHOTOS! You can't have a blog without beautiful images, right? And though I tried, I never seemed to make the right connections with local photographers that were able to capture images in the style and aesthetic that I was looking for...that is until recently! The experts say in order to write a successful blog you have to determine who your audience is. For me, that was easy. I'm a teacher at heart so I knew that I wanted to journal the design process in a story-telling way (especially since my focus is in the very beginning of the design phase with spatial planning and interior architecture), sharing tips and techniques along the way that would benefit design lovers with varying knowledge, experience and expertise. When I started I hadn't planned to include design guides with each post but they developed shortly after I started and I like how they enhance the teaching approach. 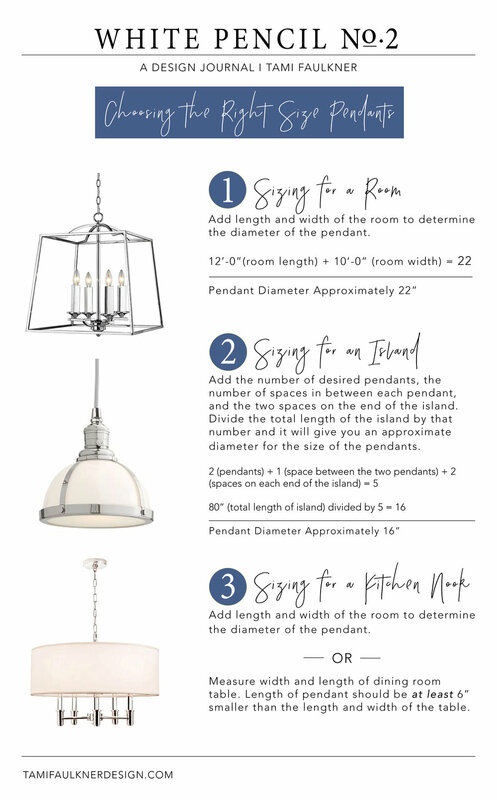 For example here's one I recently included with tips on selecting the right size pendant lights. Same thing goes with The Take Away notes I include, like the Design Guides they've become mainstays in my post. Here's an example from the post mentioned above. These methods will make for a great jumping off point and in most situations they are pretty spot-on, but keep in mind that there is always room for tweaking things. For instance the more open and airy a fixture is the larger it can go. Today’s trends call for fewer but bolder, and larger lighting fixtures than what was being done just a few years ago. When in doubt go bigger, rather than smaller. The next hurdle I had to cross was preparing my clients for photographs. It's turned out to be much easier than expected. During my first conversation with potential clients, while going over my fees and how I work, I also explain my approach to photographing projects, and that I only take on those thaI can be photographed. Since establishing that perimeter I haven't had any clients who are opposed to photos being taken. The next challenge was a more personal one...if I wanted to approach my blog in a journalistic sort of way, I had to learn to be OK in front of the camera. I won't pretend that it's been easy. It still unnerves me but breaking into it with my beautiful clients from Project Shake Front (shown in this post and others) has made it a million times easier since they are comfortable in front of the camera, and don't mind being in the photos. Thanks for following along, and being part of my design journey as I find my way with this new endeavor. Feel free to leave comments, pin images and share post. It would make my heart happy. A big thanks to the clients from Project Shake Front and the talented photographers who I've had the privilege to work with during the last few months. Jaylene, Rachel and Libby, thank you for helping me realize my creative vision, while working to put me at ease in front of the camera. Thanks to them I have piles of beautiful project images just waiting to be shared!